The Southern Illinois University Edwardsville School of Engineering (SOE) introduced students pursuing the Kaskaskia College 2+2 program to the numerous academic and experiential learning opportunities it has to offer during a campus visit on Friday, Oct. 12. 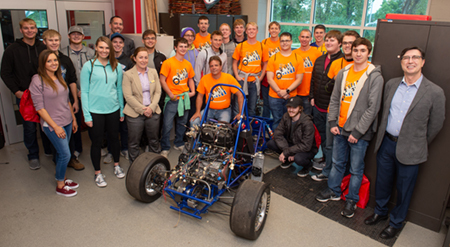 While at SIUE, the 26 visiting students sat in on a few upper division classes and met with leaders from the School’s Cougar Rockets club, and Cougar Baja and Formula SAE teams. They also toured SOE classrooms and labs, met with administrators, and visited with former Kaskaskia College 2+2 students who have continued their studies in the SIUE SOE. SIUE’s 2+2 agreements allow students to efficiently progress toward completion of their bachelor’s degree. The School of Engineering’s program allows students to follow a specific curriculum while attending their first two years at Kaskaskia College, then transfer into their intended major at SIUE. SIUE and Kaskaskia College have 2+2 agreements for five programs, including civil, computer, electrical, industrial and mechanical engineering. For more information, visit siue.edu/transfer/programs/kc-2+2. Photo: A group of students completing the 2+2 program between SIUE and Kaskaskia College visited the SIUE School of Engineering to learn about its academic and experiential learning opportunities.